Following the lows of 1.6257 the pair GBP/USD has corrected and is now trading in the range of 1.6325-1.6345. If the bottom limit of the trading channel 1.6257 is not broken down, the pair is likely to return to the level of 1.6620. The main obstacle for the “bulls” is the moving average with the period 200 (1.6430). Significant indication of recovery of British economy is the rise in mortgage lending, which has reached a record level in 6 years: 71.638 new loans have been approved. Experts believe that demand for mortgage lending was triggered by the rise in price for real estate in the country. It is worth noting that additional support to the Pound can be provided by the decision of the Bank of England to raise interest rate this year. If economic recovery maintains and domestic demand continues to increase, such decision would be adequate. Mark Carney says that the Bank of England will be guided by inflation rate and employment in the country. If Unemployment rate falls from current level of 7.1% to 7%, regulator will toughen monetary policy. The nearest resistance level is the moving average with the period 200 (1.6430). 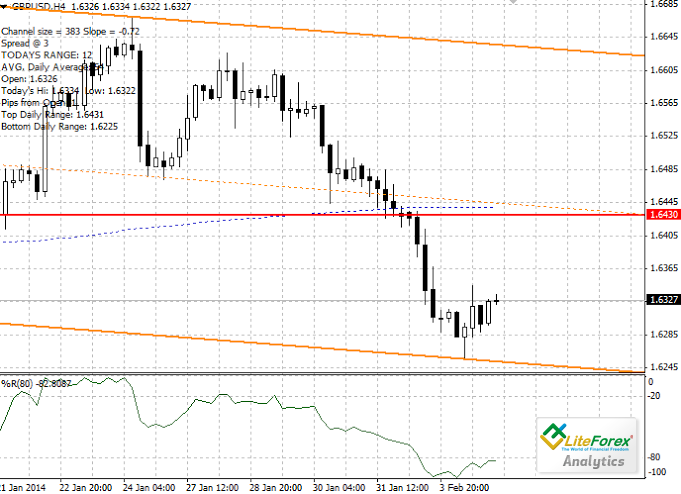 Support level is the bottom limit of the trading channel (1.6257). It is recommended to open long positions after breakdown of the level of 1.6430 with stop-loss at 1.6390 and a target of 1.6580.